HI Portland Hawthorne i Portland, USA: Bestill nå! Make like a local in Portland at HI Portland Hawthorne hostel, your eco-friendly home away from home in one of the city’s prettiest neighborhoods. This converted house is a cozy spot to hang out with other travelers from around the world, and a perfect base for exploring the food, art, music, and culture of Portland with new friends. Check out the quirky restaurants and shops of the surrounding Hawthorne neighborhood; take a quick bike ride or hop the bus downtown to take in the sights, trendy shopping, and endless food trucks that make the city so lovably “weird”; or get some mud on your shoes at a nearby park or hiking trail. Back at the hostel, fire up the BBQ for a group meal, sit back and do some people-watching from the expansive front porch, or just relax with a cup of tea and a book in the comfy lounge. On rainy days, watch the hostel’s living roof gather water, and on summer nights, enjoy open-mic nights and outdoor movie screenings in the back yard. 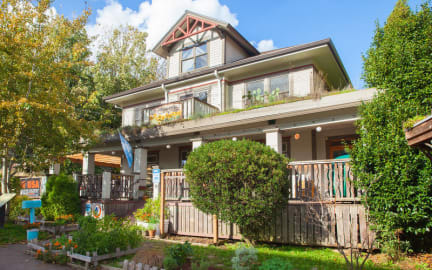 With a living garden roof, a water collection system that’s one part smart science and one part outdoor sculpture, on-site composting, sustainable gardens, and green cleaning practices, the HI Portland Hawthorne hostel is one of the most eco-friendly you’ll find anywhere. Come visit us and see what makes us a travelers’ favorite in this beautiful city! FREE light breakfast of cereals, oatmeal and coffee or tea and supplies to make all-you-can-eat pancakes. No lockout or curfew. High-speed internet kiosk available, as well as free wireless. Guest phone with free calls anywhere in the US, free organic linens and towels, free parking. Discount bicycle rentals on-site; Lockers, TV room,and coin-operated laundry machines are available, too. Please call directly for private room availability. Tours are available from the hostel to the Columbia Gorge, Mt. St. Helens, Whale Watching, Historic Portland, and others. Dorm Beds-We need a notice of 24 hrs in advance if you need to cancel (by 12pm (noon) Pacific Time the day prior to your arrival) or your card will be charged for the first night. Private Rooms-We need a notice of 48 hrs in advance if you need to cancel (by 12pm (noon) Pacific Time two days prior to your arrival) or your card will be charged for up to two nigthts. Check-in is between 15:00 (3 pm) - 22:00 (10pm). No arrivals are allowed after 10pm. There is no curfew or lockout period once you are checked in.